A Blocked Account (Sperrkonto) is required if you are planning on financing your studies yourself. You must make this change in the account opening form to ensure that you don't face problem later on. This has to be opened when you are in India. Do I need a confirmed admission to apply for Blocked account? How to open a block account in Deutsche Bank, Germany ? There are 2 ways to open the blocked account. In first option, it can be opened by Deutsche Bank India. In the second option, you have to visit German consulate. Deutsche Bank India provide Blocked account opening services. Please contact Deutsche Bank branch near your area. Forms authentication is done by Deutsche bank India to avoid visiting German consulate. 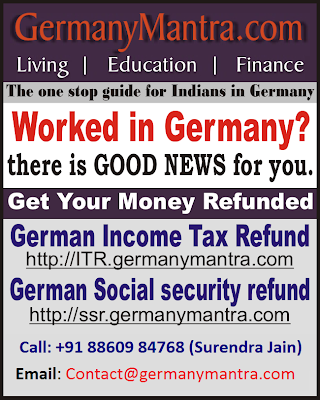 Using this service, you can open blocked account without going to German Consulate. All the procedure can be completed by post within India. The entire process takes about 1-2 weeks. courier charges shall be borne by Deutsche bank itself. Obtain information and the application forms from website. Please note that depending on the age (< 18 years or >= 18 years) the forms are different. After filling out the application form, you will have to get your signature and a copy of your passport certified by the German Embassy as per instructions given in the form. The above mentioned office in Hamburg arranges the opening of an account with the office of the future residence and informs you directly, without intervention of the General Consulate, by post and parallel by email about the account number, BLZ and IBAN of the opened account. It takes 2-3 weeks to open account. finally you transfer the necessary amount + EUR 150 towards bank charges to the account and prove this to the German Embassy/Consulate in your home country (India). DB will also inform embassy about the same. How to open a block account in Kotak Mahindra Bank, India ? You can contact any branch of Kotak Mahindra in India and request opening of a blocked account for student visa for Germany. You will have to present proof of opening of such account at the time of applying for your visa. After having arrived in Germany, you can request Kotak Mahindra Bank to transfer the full deposited amount into a blocked account at any local bank in Germany. Please submit the e-mail confirmation regarding the activation of your blocked account and the transfer of the amount of at least 8640 Euro at your visa interview. Is this money sufficient for entire duration of study? No!! On time of arrival (in addition to rental, registration and living costs) you also need to pay tuition fees and semester contribution to enroll at the University. (This note is valid for those students who haven't got an exemption from tuition fees). The costs are approx. 700 € per month and therewith higher than your monthly limit of withdrawal. Corresponding to this blocked account you may not be able to pay these semester fees. So please remember to bring enough money in addition to be able to pay for these costs. Or cover your account with a higher amount corresponding to the requested additional fees. Also please remember that you will have to pay these additional costs every new semester and therefore need to have enough money on your account. Caution: While opening Bank account, students should not take any unwanted Health insurance, Life insurance, Medical insurance or any other type of product unless really required for any other reason. It is not required to buy such product/service to open blocked account.